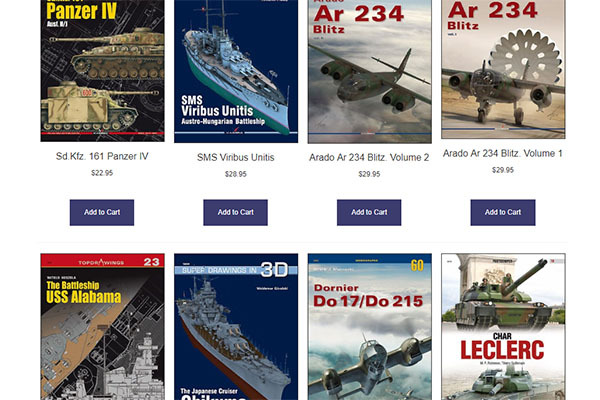 Casemate Publishers is having a large sale on many Kagero books, with 60% off their listed prices. Some of these books you have seen reviewed here, and many of you out there are already familiar with the quality of material in these publications. The Kagero series discounted include Top Drawings, Naval Archives, Monograph Special Edition, 3D Superdrawings, Photosniper, SMI Library, Monographs 3D Edition, Top Colors, and more. Subjects include aviation, naval, and armor, with World War 2 having the majority of coverage. There are WWI and modern subjects covered as well, though, and with well over 100 titles available, this Kagero discount section will likely have something for everyone. If you have been wanting to add some Kagero titles to your reference library, now is a great time to do so. Visit the Casemate page with these discounted titles today and get them while you can, as there is no telling how long this sale will last.